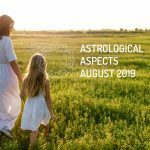 August 2019 is characterized by four important astrological events: the beginning of the direct phase of Jupiter in Sagittarius (11/08); the beginning of the retrogradation of Uranus in Taurus (11/08); the conjunction Sun-Venus in the sign Leo, known as Venus Star Point (14/08); and a stellium (accumulation of planets) in Virgo. What does this mean in terms of the astrological transits of August 2019? With Jupiter directly in Sagittarius, the revision of old personal beliefs ends, and a period for the application of lessons of consciousness learned begins (follow the path of your expansion). However, it will not be easy, since the retrogradation of Uranus in Taurus implies clinging to old known structures, for fear of what changes can generate in different areas of your life. Moreover, the Venus Star Point in Leo (conjunction Sun – Venus) is the perfect opportunity to be aware of the magnitude of your desire, and act accordingly (you are your own desire). Finally, the stellium in Virgo will remain active until mid-September 2019, and will highlight the more perfectionist traits of the personality, the link with work and the welfare state. The accumulation of planets in the sign of the Virgin will begin to form on 18/08 with the entrance of Mars, which will be followed by Venus (21/08), the Sun (23/08), Juno (23/08), and Mercury (29/08). The high point of the stellium will be on August 30, when the celestial bodies present in Virgo will be joined by the influence of the New Moon, in the same sign. Here are some of the planetary events that will affect the astrological transits of August 2019. If you did consciousness work, you will now be interested in building new beliefs, rather than clinging to stories from the past that limited your power of expansion. Academic and investment opportunities abroad. Stubbornness. Fear of exploring new experiences and banishing old patterns of behavior. Changes that do not obey a real need. Reflection on the factors that undermine the building of personal trust. The conjunction Sun – Venus in Leo, during August 2019, will allow you to discover and set in motion your true desires (or intentions) in matters related to the expression of natural talent, the possibility of having children, promote your own project or reconnect with fun and romance. Discretion. Attention is turned to the professional environment, with great practicality and efficiency. Ability to find productive and responsible teammates. Modesty. Self-control. Tendency to overanalyze feelings. The desire for perfection hinders the emergence of new romantic relationships. Efficiency. Practicality. Organization. Perseverance. In spite of the dedication to the proposed objectives, they can be postponed due to the yearning for perfection. Commitment to professional relationships, which contributes to generating greater efficiency and productivity in the work environment. Caution against excessive criticism, towards colleagues or life companions. Rationality. Acute perception. Passion for logic. Interest in solving intellectual challenges. Attention to prejudices. The New Moon in Virgo emphasizes intentions aimed at changing life habits; finding a new career path; differentiating between what you are and what you do; learning to take care of yourself, and reaching out to those who need it most.